always time to give thanks...and grab a snack. Canadians are applauding Christopher Plummer’s win last night for Best Supporting Actor, dubbing it “The Canadian Oscar.” Today’s news is filled with clips of all the wonderful acceptance speeches. Yes, the Academy Awards always puts me in mind of the art of the thank you. So it is a good reminder for me to take time to pause and offer thanks to those who have had an influence on this blog, to those who have provided community and friendship, pass along a little casting news, and to remember those who famously lost their lives in the time of Downton. My first thanks always goes to God for blessing me with a wonderful and supportive husband, next to my husband, and then to all of you for keeping me company as I blog my way through the food of Downton Abbey. 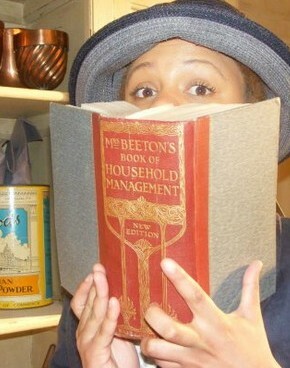 I have been thrilled by the follows, subscriptions, comments, likes and tweets (@downtoncooks) from all over the world. We have surpassed 16,000 views in under 2 months; 2,200 fans on one day frantically sought last minute advice on what to serve for the finale. I was even interviewed by a LA public radio station. I also recently set up a Facebook page and Pinterest boards. My YouTube channel holds the clips I post, but I may pull my hair up in a bun, don a frilly apron (don’t count on it) and post a cooking segment or two in future. I have been enjoying the experience of keeping my social media skills sharp, and as Meryl Streep mentioned in her acceptance speech last night, its friendship which makes it all worthwhile. Aside from Mrs. Patmore and the flurry of activity in the Downton kitchen, I have been inspired by other foodies, both dead and living. Thank you. Mrs. Beeton: the domestic goddess of the Victorian era is online. Chef in Disguise: Sawsan, in Jordan, provided excellent techniques to produce a great scone. 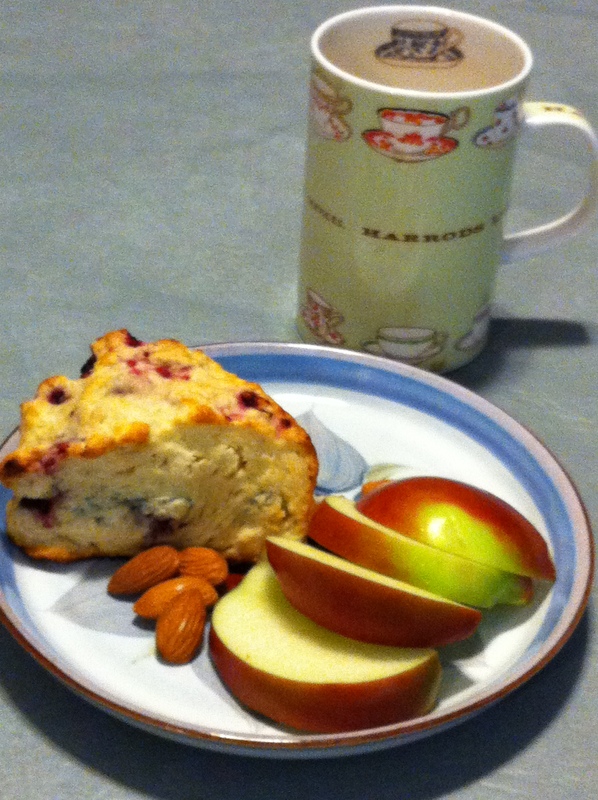 Sadly, I am now obsessed with scones. Profiterolesandponytails. Barb, in my hood, reminded me that I couldn’t live without black bean brownies. Kitcheninspirations, Eva, also in my hood, shared her brother-in-law’s wine jelly recipe, and put me on to Sawsan. 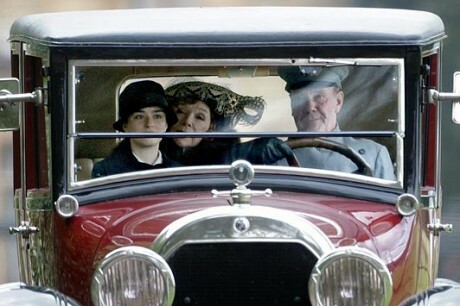 Hugh responded “@DowntonCooks that’s a bit sarky of you dearie!”. Now when a celebrity responds to your tweets, you would hope it would be complimentary, although he did call me dearie (is that a good thing?!) Well, at least that’s how Canadians think (sarky). I tried to clarify with a reply that I thought it was a good thing but that Twitter sometimes makes twits of us. Well, I may have not been sarky in this instance, but he is right, I do have a sarcastic streak in me. I do wish to give thanks to Hugh and the pornbot ban team to help bring attention to this issue. Pornbots, spambots, hackerbots, followbots etc are hard to suppress because of Twitter’s open social platform. In the corporate world brands are at risk if a group decides to cyber attack a company’s twitter account. Still, if you bring enough attention to the issue, some 10 year old will be motivated to find a solution…perhaps while watching Downton Abbey with his/her parents (I guess that was sarky). While PBS finished its run of Downton, there are a whole new crop of fans emerging as the show is broadcast from the beginning on new networksn. We welcomed South Africa and Canada last week to our club. I even included a top 10 list of why Canadians will love Downton Abbey(yes, it was a bit sarky). A friendly warning, though. Once you have seen a couple of episodes, it is like crossing the Rubicon: the point of no return. The historical reference is to the famous crossing of Julius Caesar’s army of the Rubicon River in Italy, considered an act of insurrection. For those who have gone though the cycle of 2 seasons and a bonus Christmas episode, we patiently wait as Season 3 is filmed, produced and released in the UK this Fall, on PBS next April. In the meantime, we rewatch episodes with new viewers, plan pilgrimages to Highclere Castle (where Downton is filmed). Cara Theobald will play a new kitchen maid called Ivy. Lucille Sharp has joined as Martha Levinson’s lady’s maid Miss Reid. Matt Milne of War Horse fame, has signed up to play a footman named Alfred. In January, Oscar-nominated actress Shirley MacLaine was brought in to portray Martha Levinson, the mother of Lady Grantham). The Canadian Broadcasting Corporation (CBC) is Canada’s version of the BBC. Their excellent documentaries include the recent release of Waking the Titanic (click to view the video). The 100th anniversary of the sinking of Titanic will be marked on April 14th of this year. Lest we forget those who lost lives in this tragedy, thank you CBC for this wonderful personalized account of the group of 14 from a small village in Ireland. Waking the Titanic traces the stories of 14 young men & women from North Mayo, Lahardane who had the misfortune to be traveling in steerage on April 15, 1912. This little hamlet lost more of its people in this disaster (percentage wise) than any other community. It dramatizes their hopes and dreams of a better world. Steerage class passage took 2 years to save. We learn how a ladies’ hat saved–but could have cost one young lady–her life. Families of the survivors talk of how the experience shaped their lives. Costa Concordia survivors should take note that Titanic survivors were only paid $25 in compensation. For those planning tribute dinners this April, I have included dinner menus for all classes of the Titanic with links to recipes. The Third Class menu appears spartan in comparison to the 1st and 2nd classes. If you have time to watch the CBC documentary online, you will learn that everything on Titanic was pure luxury. For many this is their first experience with fine linens, quality food, fresh fruit. Today I am going to provide a recipe for cabin biscuits. 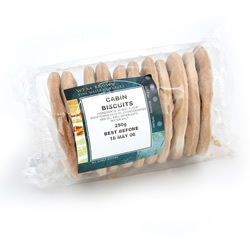 It is best to think of cabin biscuits like soda crackers that you would eat to ease an upset stomach. Long periods at sea for those who had never been at sea were eased by serving these crackers at meals. 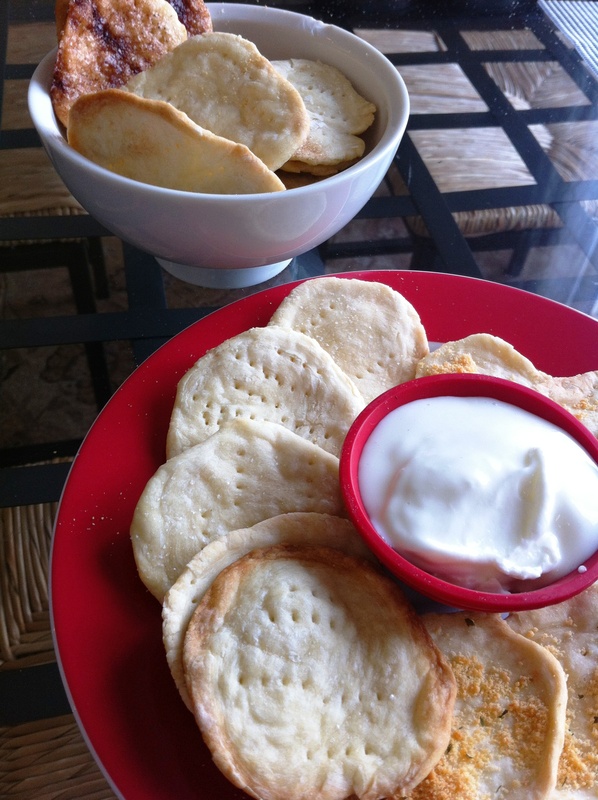 You could make these to authenticate your steerage class meal, or just serve crackers. These crackers are pretty bland, even the variations, it would help you keep your food down, though. If you are planning to pay tribute in April, I have posted menus and have been providing recipe links to recipes for all classes of service. make a well in the flour, add water and mix until you have have stiff dough. Add 1 or 2 additional tablespoons if required. Place on a lightly floured board and roll into a 1 inch diameter log/cylinder shape. Cut the log into 25 discs and place on a cookie sheet. Spray each unbaked biscuit with water and sprinkle with rock salt. Brush unbaked biscuits with melted butter then sprinke a mixture of cinammon and sugar. After 10 minutes sprinkle with parmesan cheese and chopped parsley, return to oven for an additional 5 minutes. Thanks for the shout out, Pam. You should check out my latest post which is an hors d’œuvres served on that fatal night in first class. I’ll be making a dessert as well, but not for a bit. I appreciate the shout out too Pam. Glad that you liked those brownies. Looks like your site is really developing quite a following. Good on ya! LOL – I would have had to look up “sarky” too :o) Fun post… thanks.